Clasping-Leaf Pondweed has shorter leaves with pointed tips. 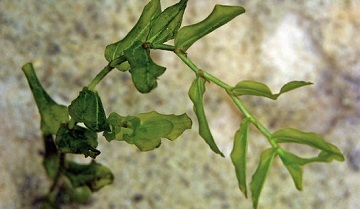 Clasping-leaf pondweed can be easily identified by its thin, delicate, oval shaped leaves. The leaves are wide and wavy with a broad base that clasps around the stem. The edges of the leaves are smooth and the tip comes to a point. Clasping-leaf pondweed can sometimes be confused with Curly-Leaf Pondweed. The easiest way to tell the two species apart is to look at the tips of the leaves. Curly-Leaf tips are rounded with small teeth on the edges while Clasping-Leaf tips will be blunt and ponted. Typically found in the northern half of the United States. Because of mineral deposits in the hard water in the northern half of the U.S., Leaves may appear brown in color. Dibrox® herbicide and Spritflo® herbicide can be used to treat clasping-leaf pondweed. You can order these products on this website. Read all product labels for complete instructions before applying products.